Month of May was full of geopolitical developments and changes in one of the most nuclear armed hostile region of the world, the CIP band (China-India-Pakistan). The new premier of China went to India on his first ever foreign visit and then to meet the new leadership of their ally, Pakistan. In the meantime Afghan President came to India in his unofficial low profile meeting, but making solid developments. Indian Prime Minister in the hope of surviving in the next election met with Japanese and Thai leadership signing various economic and strategic pacts. All this happened in a short period of time and quite related to each other. China renewed the border dispute with India by entering 19 Km deep inside Indian territory in Laddakh and setting up temporary bases. With this, People’s Liberation Army of China has made it clear that with the new premier of China is not going to change its stance on the border issue between the two countries. China’s aggressiveness is as a result of India’s passiveness specially on the border issues with China. A number of times India just ignores Chinese intrusion just to avoid any major or minor conflict with the giant dragon. India’s behaviour like a “wet cat” encourages China to suppress India with its power. The border dispute was resolved on the assurance from India that its army will not patrol on its own territory of that region and will treat it as a disputed territory. The government in India later cheered that they have resolved the border dispute peacefully and patiently. Such a wonderful achievement, really!! The term string of pearls (Read More: Chinese String of Pearls Theory) theory is mainly used for China, how it is surrounding India and other south east Asian nations with its presence forming a string of pearls. String of pearls may or may not be a threat for the countries being surrounded, but surely a warning that at the time of need China may anytime use its developed infrastructure against them. Unlike India, Vietnam and Philippines have been more assertive in claiming their sovereignty in the disputed South China Sea. Almost an year ago, officials of Philippine maritime attempted to arrest Chinese fishermen in waters off Scarborough Shoal, claimed by the Philippines as within its Exclusive Economic Zone. This is something which India could have done with the Chinese soldiers who had entered inside the Indian territory. India had full rights to do so and then could have opened diplomatic channels for returning the soldiers with a warning. The South China Sea area is crossed by more than half the world’s total trade and has an estimated vast energy and mineral reserves completely claimed by China and in part by neighbouring nations: Vietnam, Malaysia and the Philippines. One of the main reason of the tension is fishing rights of Philippines, Vietnam, Malaysia and Brunei in their own waters. China stops fishing near its shores from mid-May until August to facilitate nurturing of fishes in the water. This makes Chinese fishermen, guarded by naval vessels, head to the waters claimed by neighbouring countries without even recognizing their territorial claims, China considers almost all of the South China sea as its territorial water. On May 10, the Philippines claimed China intruded inside its 370 Km exclusive economic zone with a military frigate, two surveillance ships and some fishing boats around Second Thomas Shoal, days after the incident, the Philippines launched a diplomatic protest which did not stop China as after ten days on May 20, Vietnam filed a diplomatic protest saying one of its ships was rammed by a Chinese vessel on May 20 in its water. China simply ignores the territorial claims made by its neighbours in the South China Sea as it is assertive that South China sea is Chinese territory and there is no way China would hold a dialogue with the neighbours on the territorial issue. According to Ni Lexiong, professor of international military affairs and diplomacy at the Shanghai University of Political Science and Law, China’s neighbors are making claims in the South China Sea that are “not reasonable” because they want access to oil resources. 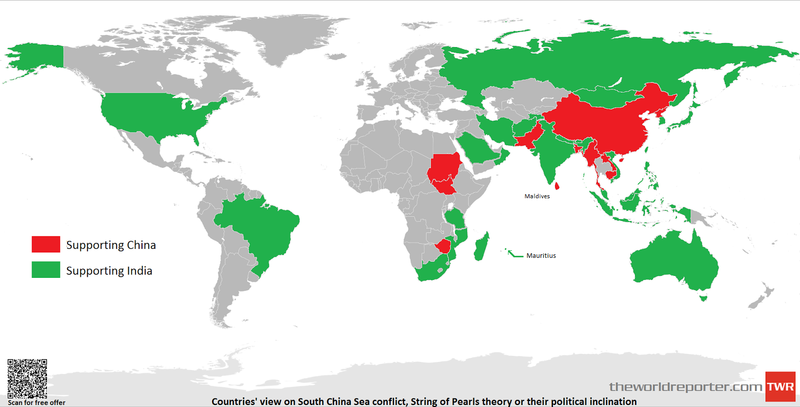 India’s opinion on Chinese string of pearls theory is a bit disappointing to China’s south east Asian neighbours who are in need of non regional powers to mediate for bringing peace and stability in the region. According to India, Chinese economy is dependent on its large number of imports and exports which passes through Persian Gulf and Straight of Malacca, hence having security setup to secure its economy is legitimate and India should not worry. India has quietly made way for its interests in the island nations and African nations in Indian Ocean Region, which includes Mauritius, Maldives, Seychelles and Madagascar and the countries of South Africa, Tanzania and Mozambique with a very agile foreign policy, economic compensations like the double taxation exemption with Mauritius, and military aid. Indian Navy maintains a robust hydrographic arm, with eight sophisticated survey ships, a number of survey aircrafts, and state of the art facilities in Dehradun and Goa. The well equipped surveying arm of the Indian Navy has made several successes in undertaking various survey assignments for countries like Oman, Saudi Arabia and island nations in the Indian Ocean making a positive strategic footprints that would certainly irk China. India has in fact gained ship berthing rights in Oman which is a strategic location for the fight against piracy. The port also allows the Indian Navy to monitor the SLOCs of Hormuz and Aden. India has signed an MoU with Mozambique that will provide the African nation Indian piracy patrols. Going a further step, in a 2007 report, which has not been denied by the government, it was reported that India has setup a listening post in the African island nation of Madagascar. Forums like IOR-ARC (Indian Ocean Rim – Arrangement for Regional Cooperation) and IBSA (India-Brasil-South Africa) have been formed for better commercial, energy and resources link with Africa. Assertive India not only brought Mauritius, Mozambique and Madagascar to back India’s move to block Pakistan’s membership in IOR-ARC, but also managed to block China’s access to IBSA. According to an unconfirmed report, India signed an agreement on Defence Cooperation in 2001 with Mongolia stationing radar systems able to monitor Chinese missile tests. Defence cooperation also included holding bilateral military exercises and discussion on having an airbase which has not yet been successful. India on the other hand has developed strong military relationship with Maldives, which includes basing two helicopters permanently in the island nation to enhance its surveillance capability. India will setup 26 radars in Maldives along its entire coastline for seamless coverage of approaching vessels and aircraft. This radar chain will be interlinked with the Indian radar chain with a central control room in India’s Coastal Command. African island nation of Mauritius enjoys deeper relations with India. India had setup the Mauritius Coast Guard in the 70s and the island nation gone even further to lease two islands to India allowing it to use it “as per its benefit”. Coming back to the land, India maintains Farkhor air base and has been involved in renovating Ayni air base both in Tajikistan minutes away from Pakistan Occupied Kashmir and China occupied Kashmir. (Read Both the Stories: India Expanding Its Strategic Presence in Other Countries). As Chi Haotin, general of People’s Republic of China said, “The Indian Ocean is not India’s Ocean”. India says, “South China sea is not China’s sea”. Seeing Chinese increasing activities in Bangladesh, Pakistan and Sri Lanka, India took similar steps to irk China by increasing its activity in South China sea. India knows that it may not be able to contain China alone, as a result India collectively with Japan, Russia and the US stands against China. India and Vietnam has signed several defence agreement which includes selling of state of the art, world’s fastest supersonic cruise missile, Brahmos. Vietnam has also provided basing rights to Indian Navy on its port of Nha Trang on a western shore of the South China Sea. Russia, which has been recently partnering with China in almost all the global events surprised China with its move to provide six Varshavyanka-class submarines to Vietnam which has enhanced anti-ship and anti-submarine warfare capabilities to perform in shallow waters, a perfect card to play in the South China sea. Russia whose superpower attitude has been on decline since 1991 is expecting to enter South China sea conflict in its own way when people have started analyzing that Russia has lost to China in its race to become the next superpower (What’s your opinion on this?). In 2011, India’s state-run explorer, OVL signed a three-year deal with PetroVietnam for developing long-term cooperation in the oil sector, accepting Vietnam’s offer of exploration in the South China Sea making China protest against this move. Vietnam, which had a tough history with United States has invited US presence in the region giving the signal that for regional peace and stability Vietnam doesn’t mind participation of non regional nations. To solidify its relations further with United States, Vietnam is expected to request the US government for the sale of Lockheed Martin P-3 Orion maritime patrol aircraft, a senior company official told IHS Jane’s. This makes clear that Vietnam is trying India’s long trusted policy of forming good relations with both the United States and Russia. Vietnam’s attitude shows the potential, which it has, to become the regional power of south east Asia. In the meantime, US Defense Secretary Chuck Hagel has assured Asian nations that despite their sharp cuts in defence budgets, the Pentagon will continue to shift its military focus to the Asia Pacific region. In 2009, India contributed $1.2 million and advanced $774,000 to the TTEG (Tripartite Technical Experts Group). India volunteered to survey wrecks in the Malacca Straits which approved by the TTEG, further irking the Chinese. Responding to the recent visit of Indian Prime Minister Manmohan Singh to Japan discussing maritime security cooperation, Chinese media has raised concerns that Japan is trying to encircle China with the help of military and economic cooperation with India. While India easily bows down to China making compromises on its own territories, India is seen very assertive and aggressive in its policy of containing China in the international soil and waters. Leadership of both the nations often meet with shaking hands and smiles on their face signing more trade agreements and contracts and hoping for better cooperation in the future, but behind their smiley face both the nations know what they are doing and what is needed to be done.